바른 음악교육과 대한민국 플루트 문화의 발전을 위해 출범한 한국플루트교육자협회 KFEA(Korea Flute Educators Association)가 2012년 11월, 제9회 정기연주회 "별이 빛나는 밤“ 을 개최한다. 한국플루트교육자협회(KFEA)는 현재 국내 유수 대학의 교수, 정상급 오케스트라의 연주자들과 전국 각지의 학교, 학원, 문화센터 등, 다양한 형태의 교육기관에서 플루트 교육자로서 활동하는 광범위적인 규모의 열린 플루트인들을 중심으로 구성된 단체이다. 바른 음악 교육과 대한민국 플루트 문화의 고른 발전을 위하여 뜻을 같이 한 본 협회는 정기적인 모임을 통해 플루트 연주법과 교수법에 대한 학술적 연구와 세미나를 주최하고, 학생들을 위한 실제적인 방안을 제안하고 있다. 또한 이러한 결과를 실천하며 교육자와 연주자로서 스스로의 자질 향상을 위한 연습과 훈련을 자체적으로 갖고 있다. 첫 출범부터 꾸준히 기존 오케스트레이션을 플루트 오케스트라에 접목시키는 연구를 해오고 있는 KFEA 오케스트라는 지난 2011년 세계국립극장 페스티벌에 <심포닉 in 플루트>를 선보이며 국내 유일한 클래식 부문 공식 초청작으로 선정되며 주목받았고, 올 2012년에는 3월 스페인 국제 플루트 컨벤션, 8월 라스베가스 NFA 미국 플루트 컨벤션, 그리고 베이징 인터네셔널 플루트 페스티벌에 공식 초청되어 콘서트를 가졌다. 본 협회는 매년 상반기에는 플루트오케스트라 정기연주회를, 하반기에는 음악을 공부하는 학생들과 멤버들에게 협연 기회를 제공하는 ‘별이 빛나는 밤’ 을 개최하고 있다. 이홍규는 청주대학교와 동 대학원을 졸업하고 오스트리아 인스부르크 시립 음악원, 폴란드 쇼팽 시립 음악원, 그리고 러시아 글로즈노프 콘서바토리에서 공부 하였다. 그는 귀국 후 서울시립교향악단의 단원으로 활동하였으며 동아음악콩쿠르에서 입상하였고, 95년도 교향악축제에서 협연, 인스부르크시립교향악단, 서울시립교향악단, 코리안심포니오케스트라, 청주시립교향악단, 광주시립교향악단, 불가리아 챔버 오케스트라 등과 함께 협연 무대를 가져 왔다. 이홍규는 세계적인 플루트 메이커 Burkart의 공식 아티스트로 선정되어 활동하며, 오스트리아, 일본, 중국, 네덜란드, 헝가리 등 세계 각국에서 연주 활동을 하였고, 2012년부터는 KFEA(한국플루트교육자협회)의 회장직을 맡고 있다. 현재 충청대학교 실용음악학과 학과장, 충청필하모닉오케스트라의 지휘자로 활동 중이며 예원학교, 서울예고, 선화예술학교, 선화예고, 계원예고, 덕원예고, 안양예고, 고양예고, 대전예고 등에 출강하며 후학을 양성에 힘을 기울이고 있다. Flutist Hong Gyu Lee was born in Korea. He studied at Cheongju University for flute performance, Cheongju Graduate school of Music, The municipal music academy of Austria Innsbruck in Austria, The municipal music academy of Poland Chopin in Poland, and Russia Glazunov Conservatory in Russia. He played at The 95 Symphony Festival and had accompanied performances with The Seoul Municipal Symphony Orchestra, The Korean Symphony, Gwangju Municipal Symphony Orchestra and so on. In Austria, Japan, China, Holland, Hungary, and more countries in the world. 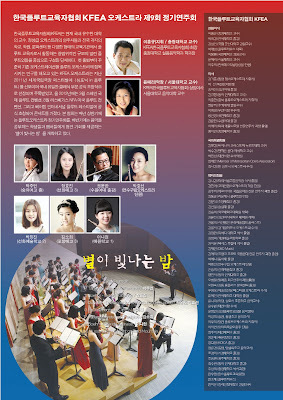 Also he has awarded in the Dong-a Music Competition which is one of the best music competition in Korea. He is working for a professor of practical music at Chung Cheong University, and a supervisor with conductor of Chung Cheong Philharmonic Orchestra, faculty at Ye Won, Seoul, Sun Hwa Arts, Gyewon, Deogwon, Anyang, Goyang, and Daejeon Arts high schools, a regular member of The Seoul Municipal Symphony Orchestra, and one of the Burkart Flute Artist. 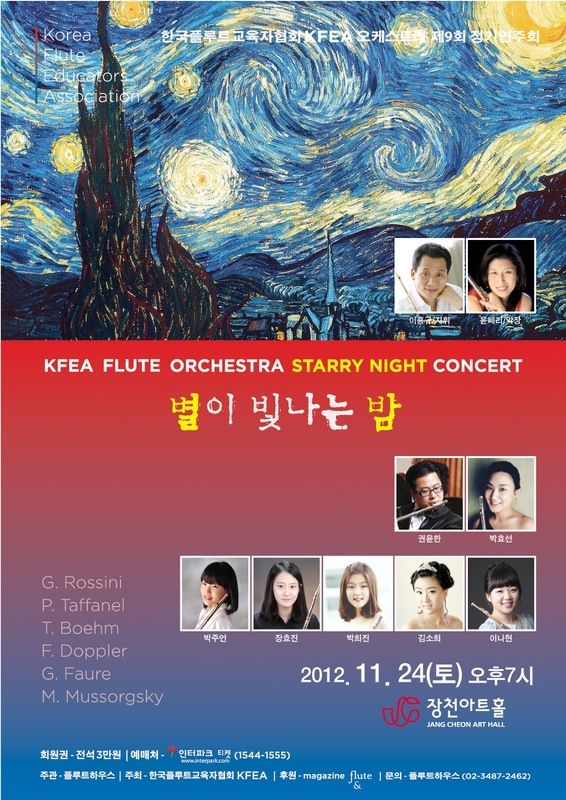 Moreover since January 2012, he has positioned to chairman of KFEA(Korea Flute Educators Association). 윤혜리는 1992년, 스위스 제네바 콩쿠르에서 관악부문 한국인 최초 입상을 하며 유달리 관악부문에 취약했던 당시 한국음악계에 신선한 충격을 안겨주었다. 이후 뉴욕 필하모닉, 보스턴 심포니 등 메이저 교향악단의 단원 배출구로 유명한 뉴월드심포니 오케스트라 오디션 우승을 통해 한국 관악 연주자로는 드물게 세계 오케스트라에서 활동하게 되었다. 그는 신예 플루티스트로 촉망 받던 시절 거장 장 피에르 랑팔로부터 `가장 이상적인 소리'라는 격찬을 받았다. 스페인 테네리페 심포니 오케스트라 수석 플루티스트로 활동하였으며, 최근에는 베이징 인터네셔널 플루트 페스티벌, 일본 플루트 컨벤션 초청 독주회, 제2회 세계 플루트 콩그레스 한국대표, 제2회 아시아 플루트 연맹 서울대 초청 및 주관, 2009 고베 국제 플루트 콩쿠르 심사위원 위촉 등, 한국을 대표하는 플루티스트로 활약하고 있다. 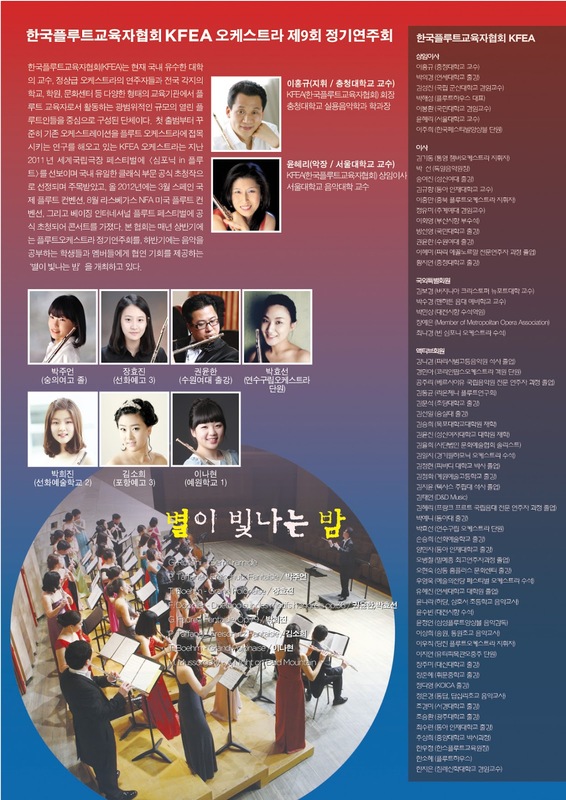 윤혜리는 KFEA(Korea Flute Educators Association)의 발기인이자 상임이사, 그리고 서울대학교 음악대학 교수로 재직중이다. Hyeri Yoon is First-Prize winner of the Philadelphia Orchestra Young Artists Competition and third-prize winner of Concours International d’Execution Musicale in Geneva, flutist Hyeri Yoon’s extensive solo concert engagement have taken her all over the world. Ms. Yoon holds Bachelor of Music degree from The Curtis Institute of Music where she studied with Juilus Baker and Jaffrey Khaner and a Master’s degree from Basel Musik Akademie under Peter-Lukas Graf. She completed Professional Studies at the Manhattan School of Music with Jeanne Baxtresser and the Conservatoire Nationale Superieur de Paris with Alain Marion. Ms. Yoon has been principal flute of Orquesta Sinfonica de Tenerife in Spain. She has been invited as a juror on international competition such as the 7th Kobe International Flute Competition in Japan and 1st Hong Kong International Flute Competition in March 2010. Since 2007, Ms. Yoon holds the masterclass at the Festival of Prefailles in France. Since 2005, Ms. Yoon is on the professor of the Seoul National University in Korea. Besides she is working as an Executive director of Korea Flute Educators Association since 2012.
and a Master’s degree from Basel Musik Akademie under Peter-Lukas Graf. She completed Professional Studies at the Manhattan School of Music with Jeanne Baxtresser and the Conservatoire Nationale Superieur de Paris with Alain Marion. 기아대책 후원금 마련을 위한 "권윤한과 친구들의 사랑나눔콘서트"
"Please feel free to email me any questions you may have!"